The Delirium series keeps delivering! I am enjoying this dystopian tale of a girl and her "disease". Pandemonium picks up shortly after Delirium. Lena is in the Wilds and struggling to adapt to life post-Alex. A group of survivors rescues Lena and nurses her back to health. Understandably depressed following the events of the conclusion of [book:Delirium|11614718], Lena takes a while to grow into her new role as an Invalid. Joining the resistance, however, adds a new facet/a new purpose to her life as she infiltrates the Zombieland as a resistance fighter. 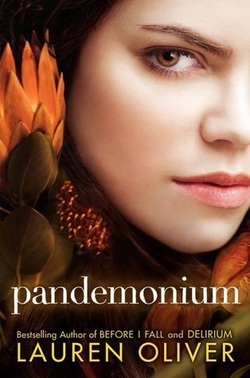 Pandemonium was slightly different than Delirium in that it was told from two different angles - "Then" and "Now". At first, I did not like the switch from past to present - I found it confusing. About 2/3 into the book, though, I really started to like the two time lines. This book kind of felt like a locomotive gathering steam until it gets a little frenetic at the end. And what a way to end the book! Definitely looking forward to reading Requiem!